Here at Cambridge, when we hear “Galapagos,” we think Darwin. Many people do. But he didn’t catalog all of the strange creatures there. 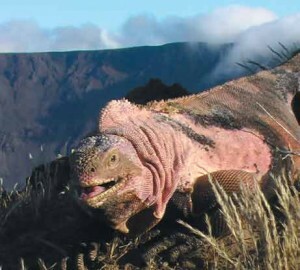 150 years after Darwin’s visit the islands, scientists have discovered a new, pink iguana that dwells on a single volcano. Don’t fret, Charles, it’s not your fault that you didn’t find it on your visit. Reading, thinking & hammering? Perhaps I’m in the wrong profession.